About 15,000 people gathered in Sydney’s Domain tonight for the final Mass of the Australian Catholic Youth Festival where it was announced that the next ACYF will be held in Perth, Western Australia. 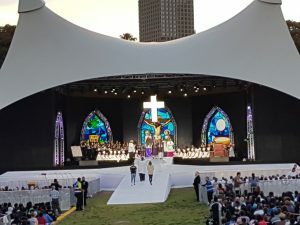 The outdoor Mass in the heart of Sydney was the biggest Catholic Mass held in Australia since World Youth Day in 2008. The young people arrived at The Domain on foot, following pilgrimages from points across Sydney, including the burial place of Australia’s first Saint, Mary MacKillop at North Sydney. The Mass was the culmination of the three-day festival of prayer, music, worship, and friendship, attended by almost 20,000 young people from across Australia and was preceded by a music concert featuring Grammy-nominated Catholic megastar Matt Maher and Australian artists. Director of the Australian Catholic Bishops Conference Office for Youth, Malcolm Hart, said the final Mass, shared with the people of Sydney, was a beautiful way to end a hugely successful ACYF. “Tens of thousands of young Australians came to the ACYF with open hearts and a love for Jesus and the Church and by bringing their enthusiasm, their faith, and their witness they made the Festival the success that it has been,” he said. In his homily, Archbishop Anthony Fisher OP, Archbishop of Sydney and Bishops’ Delegate for Youth, told the young people that they were at the beginning, not the end, of the faith experience inspired by ACYF17. “These three days have opened our eyes and minds and hearts to new horizons. We’ve encountered the deep joy found in Jesus Christ. And we’ve begun to discern how we can best share that joy with others,” he said. 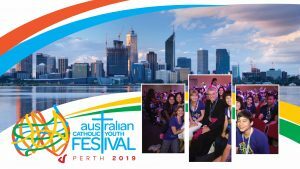 At the conclusion of the Mass, Archbishop Fisher announced that following the festival in Sydney, which heralds the beginning of the Year of Youth, the next ACYF would be held across the Nullarbor in Perth. Perth Archbishop Timothy Costelloe SDB, welcomed the announcement and said the people of the Archdiocese will be greatly blessed by the experience of hosting the next ACYF. “We have a beautiful city and the Perth Catholic community will be keen to see all young Catholics make the pilgrimage across our Great Southern Land for the next ACYF in 2019,” he said. This entry was posted in Uncategorized on December 9, 2017 by ACBC Communications.